1Olabisi Onabanjo University, Ikenne-Remo, Ogun State, Nigeria 2Department of Haematology, School of Medicine, College of Medical Sciences, University of Benin, Benin - City, Nigeria. Fruits and vegetables contain vital components such as potassium, antioxidants, vitamins and folic acid that might contribute to lowering blood pressure which is a major risk factor in cardiovascular disorders. However, the results of the few investigations on the correlation between intake of fruits and vegetables and cardiovascular disease have been inconsistent. Worse still, there is dearth of information on disease prevention with fruits and vegetables in Africans. Thus, we investigated the relative effect of fruits and vegetables on blood pressure, viscosity of blood and fibrinogen level. Ten weeks intervention study with ≥ 3 times daily consumption of fruits and vegetables by hypertensive patients was conducted. The fruits and vegetables included in the test diet were oranges, banana, pawpaw, mango, pineapple, grape, tangerine, garden egg, okra, pumpkin leaf, spinach, amaranthus and water leaf. The patients were allowed to consume the food servings while their eating habit was not restricted. Blood pressure, blood viscosity and plasma fibrinogen and nutrient intake were determined before and during intervention. The complementary fruits and vegetables included in the normal dietary regimen of the patients during the 10 weeks study increased the levels of potassium, calcium, phosphorus, antioxidants and dietary fiber significantly compared to the baseline values (P<0.01). The systolic and diastolic blood pressure were significantly lowered; percentage differences of - 9.01 and -3.73 (P<0.01) respectively were observed after 10 weeks. Percentage differences of -6.02, -38.86 and -5.29 (P<0.05.) were observed for haematocrit, blood viscosity and plasma fibrinogen respectively compared with the base line. Fruits and vegetables lowered the systolic and diastolic blood pressure, blood viscosity and plasma fibrinogen. The decrease in haematocrit and fibrinogen could influence reduction in blood viscosity thereby preventing premature CVD in hypertensive. Daily intake of fresh fruit and vegetable might be beneficial for the prevention and as therapeutic regime for cardiovascular complications. Several epidemiological studies have suggested that dietary nutrients such as potassium, antioxidants and folic acid which are associated with lower incidence of mortality from cardiovascular disease are abundant in fruits and vegetables [1,23]. However, few prospective cohort studies that have examined the relationship of fruit and vegetable intake with cardiovascular disease (CVD) have reported inconsistent findings [4,5]. Blood pressure control is important for the prevention of CVD and can be influenced by numerous factors which may include nutritional plan and maintaining a healthy body weight; consumption of alcoholic beverages and sodium in moderation ; and total abstinence from smoking. Replacing animal products with vegetable products as in vegetarian diet reduces blood pressure in normotensive and hypertensive individuals [7, 8,]. Lower intakes of fat and higher intake of dietary fiber and minerals such as potassium and magnesium are aspects of a high vegetable, high-fruit diet believed to reduce blood pressure. However, results of trials of these minerals, usually as dietary supplements have been inconsistent . Prospective studies have firmly established that the level of fibrinogen is an independent predictor of ischemic heart disease (IHD) and stroke, as important as blood pressure (BP) or cholesterol levels [10, 11]. Also in another study, it was evident that haematocrite level which is a major determinant of blood pressure (BP) or cholesterol level which in turn is a major determinant of blood viscosity was associated with increased risk of heart attack and stoke . A recent review showed that prudent low fat, high fibre diet with the maintenance of ideal body weight might temper haemostatic risk factor for cardiovascular disorders . In recent studies on African vegetarians, we found decreased BP, fibrinogen level and plasma viscosity [14, 15], which we concluded may reduce predisposition of African vegetarians to major complications of CVD/IHD. 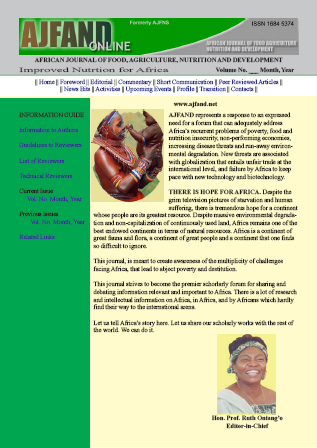 To date, intervention studies of disease prevention with fruits or vegetables or both in Africans are rare. It is important to determine whether fruit and vegetable diet is associated with lowering BP and other compounding risk factors for cardiovascular complications. 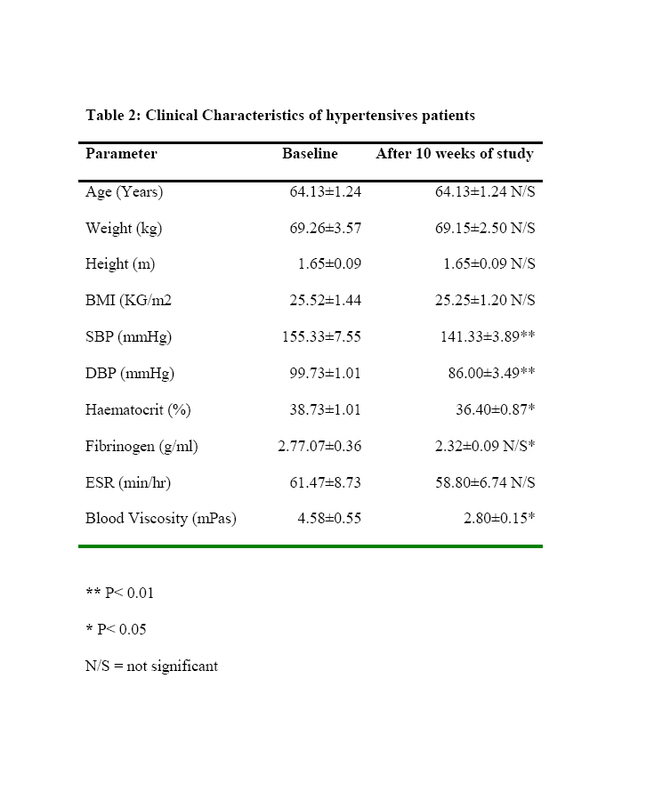 In this study, we report on the effects of fruits and vegetables on several hematological variables in Nigerian hypertensives. Twenty-five (25) hypertensive patients from the Olabisi Onabanjo University Teaching Hospital were recruited for the study. Baseline data collection included medical history, standardized medical examination, dietary assessment and anthropometric measurements of the subjects. Blood Pressure, body weight, and height were obtained with the use of standard protocols as in other related studies [14, 15]. The baseline questionnaire on medical history included questions about selected health conditions and medications used for these conditions during the preceding 6 months recommended by qualified clinical doctors. As part of baseline information, alcohol consumption, smoking habit and physical activity were evaluated. The dietary assessment included a 3-month food frequency questionnaire. The hypertensive volunteers who participated had their usual consumption of food to include 3 servings of different types of fruits and 2 servings of vegetables or vice versa of 500g in their daily diet after the baseline had been taken. The patients were trained to prepare the servings and encouraged to complete the servings on their own, while their eating habit was not restricted in any way. The study was carried out for ten weeks. The fruits and vegetables recommended included oranges, banana, pawpaw, pineapple, grape, tangerine, garden egg, okro, pumpkin leaf, spinach, and water leaf. This included haematocrit (PCV) by microhaematocrit method . The blood viscosity was measured by the method of Reid and Ugwu , details have been discussed previously  and the fibrinogen concentration was estimated by the clot weight method of Ingram . 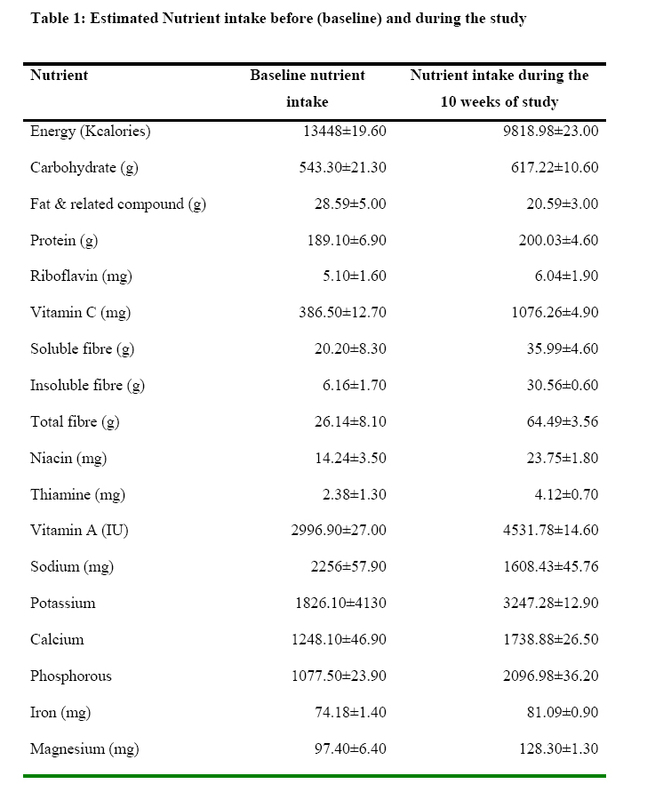 The estimated nutrient recall before and the estimated nutrient intake during the 10 weeks of study is shown in Table 1. Major antioxidants such as vitamin C, fibre, niacin, thiamine, vitamin A, calcium, phosphorus, potassium and iron were significantly higher in the test diet compared with the baseline diet (P<0.01) while there was no significant difference in protein content. The clinical characteristics of the hypertensives before the study and during the 10 weeks treatment with fruits and vegetables 3times/d is presented in Table 2. The treatment was associated with significant changes at the end of the study. The systolic blood pressure and, diastolic blood pressure were significantly lowered by percentage difference of -9.01 and -3.73 respectively at the end of 10 weeks (P<0.01) while the percentage difference of -6.02, -38.86 and -5.29, were observed for haematocrit, blood viscosity and plasma fibrinogen (P<0.05) respectively compared with the baseline assessment. The changes in the various parameters are shown in Figure 1, 2, 3, and 4. 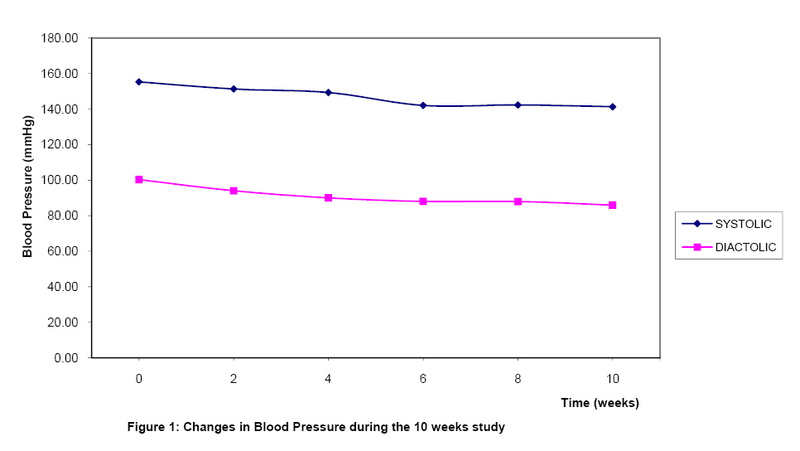 As shown in Figure 1 the decrease in systolic blood pressure (P<0.05) was observed within 2 weeks of fruits and vegetables intake and throughout the 10 weeks period of intervention. 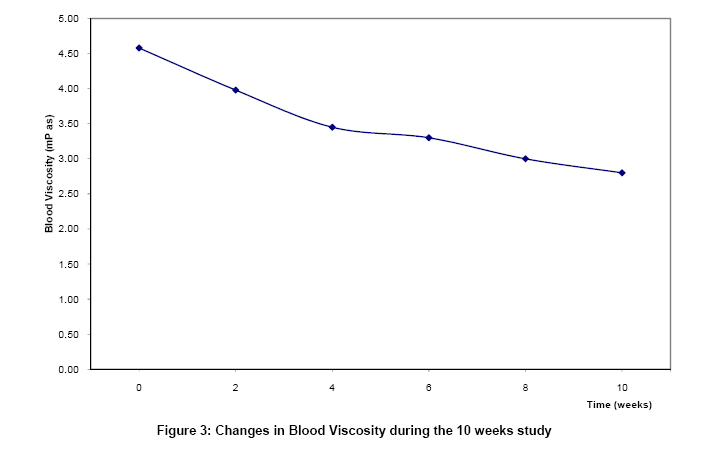 It also shows significant decrease in diastolic blood pressure (P<0.05) which continued for the 10 weeks of study. 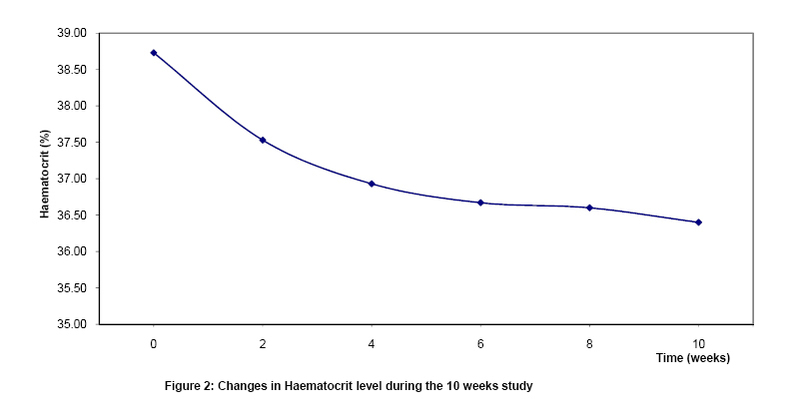 Figure 2 shows a decrease in haematocrit but this was not significant until about the 10th week of the study. 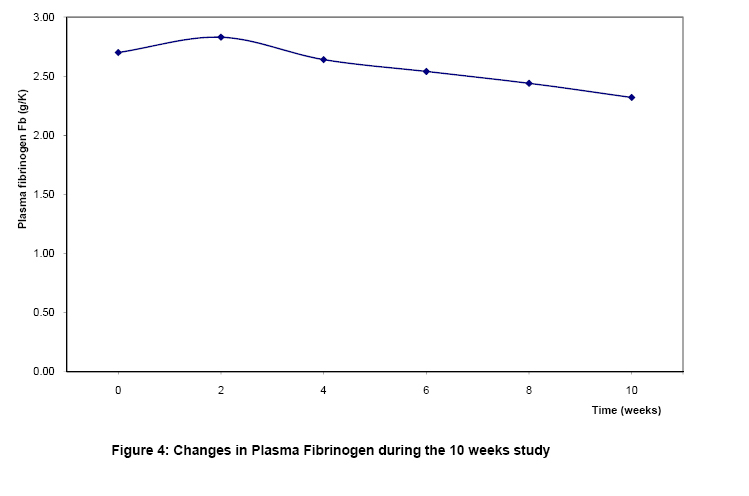 Also the blood viscosity level decreased progressively but only became significant at the end of the 10th week of study (Figure 3), suggesting it may require intake of fruits and vegetables for more than 10 weeks to obtain significant decrease in plasma fibrinogen (Figure 4). Epidemiologic studies often report an inverse association between vitamins as well as fruits and vegetables intake and disease risk [1, 2]. In our study with daily intake of ≥ times of servings of different types of fruit and vegetables of 500g for 10 weeks, significant reduction in systolic and diastolic blood pressure was observed. The reduction in blood pressure may be due to increase of potassium and reduction in sodium which has been shown to be present in our local fruits and vegetables . Similarly, in another study [21, 22] African local fruits and vegetables were reported to be rich in dietary fibre, which have been found to have hypotensive and hypocholesterolemic effects. The plant sterols or stanols have been shown to produce a reduction of plasma low-density lipoprotein cholesterol (LDL - Cholesterol) and produced prolonged platelet aggregation after collagen epinephrine activation . Recently, some fruits tested in vitro were shown to have anti-platelet properties , a situation that provided evidence for anti thrombin effect of fruits and vegetable components. Our results revealed significant decreases in levels of haematocrit and blood viscosity after intervention with fruit and vegetable. The decreased plasma fibrinogen agrees with our previous findings on vegetarians [14, 15]. The mechanism by which fibrinogen could promote CVD is by increasing plasma viscosity. In this study, we found decreased blood viscosity which could prevent premature CVD in hypertensives. It appears that 2 weeks of intervention with fruits and vegetables, which contain high fibre and relatively low fat causes decreases in blood pressure, and help reduce risk of CVD. Our result confirmed previous findings [6-8, 24] which indicated that fruits and vegetables lowered blood pressure both in normotensive and hypertensive individuals between 2 and 8 weeks of intervention. Hypertension, which is cardiovascular risk factor is modulated by the effect of fruits and vegetables by lowering fibrinogen level and plasma viscosity. Under this condition, stasis is reduced and thromboebolic complication associated with hypertension is minimized [25, 26]. This study confirmed that consumption of fruits and vegetables reduces blood pressure. Africans are not known to exhibit high predisposition to cardiovascular disease because of enhanced fibrinolytic activity , active life style and dietary habit, although, lifestyle changes have occurred due to urbanization and adoption of Western diets and smoking habits. The reversion to vegetarian diet would lower cardiovascular risk factors, which may afford protection against premature cardiovascular disorders in hypertensive Nigerians who are solely dependent on Western diet. Also affected are the haemostatic and haemorheological risk factors of cardiovascular disorders. We concluded that diet which include daily intake of fresh fruits and vegetables might be beneficial both as a preventive and therapeutic regime for cardiovascular disorders and its complications. The evidence obtained in the present study confirmed that diets which include daily intake of fresh fruits and vegetables lowered blood pressure, viscosity of blood and plasma fibrinogen. Consequently, fruits and vegetables have the potential of preventive and therapeutic regime for cardiovascular disorders and complications. Khaw KT and E Barrett-Cannor Dietary Potassim and stroke-associated mortality a 12 year prospective population study. Engl J Med. 1987; 3116 (236):.40. Tribble DL Antioxidant consumption and risk of coronary heart disease, emphasis on Vitamin C, Vitamin E, and beta-carotene; a statement for healthcare professionals from the American Heart Association. Circulation 1999; 99: 591 - 595. Morrison HI, Schanbel D, Desmeules M et al( et al not acceptable here) Serum folate and risk of fatal coronary heart disease. JAMA. 1997; 275: 1893 - 1896. Ness AR and JW Powles Fruit and Vegetable and cardiovascular disease: a review. Int J Epidemiol. 1997; 26: 1-13. Law MR and JK Morris By how much does fruit and vegetable consumption reduce the risk of ischemic heart disease? Eur J Clin Nutr 1998; 52:549-556. Dwyer J Overview: dietary approaches for reducing cardiovascular disease risks. J.Nutr 1995: 125 (suppl) 656S-665S. Rouse IL, Beiling IJ, Armstrong BK, and R Vandongen Blood Pressure lowering effect of a vegetarian diet controlled trial in normotensive subjects. Lancet 1983: 1:5-10. Appel IJ, Moore TJ Obarzanel et al ( not acceptable here}A Clinical trial of the effect of dietary patterns on blood pressure. N Engl. J Med. 1997; 336: 1117- 24. Ernst E Plasma fibrinogen an independent cardiovascular risk factor. J Int Med. 1990; 227: 365 - 372. Ernst E Plasma fibrinogen an independent risk factor for cardiovascular disease. Br Med J. 1991; 303: 596 -597. Yarnell JWG, Baker IA, Sweetnam PM, Bainton D, and JR O'Brien Whitehead PJ and Elwood PC. Fibrinogen, viscosity and white blood cell count major risk factors for ischaemic. Vorster HH, Cummings JH, and JC Jerling Diet and haemostatic processes Nutr Res Rev. 1997: 6:115 -135. Famodu AA, Fakoya EA, Osilesi O, Makinde YO, Osonuga OA, Asemota EI, Fakunle IB, Ogunledun, A and TA Fakoya Dietary Influence on blood pressure and haemorhecological risk factors for cardiovascular disease in Seventh day Adventists of the ILISAN REMO Cohort Nig J Nutr Sci. 1998; 19: 1-5. Famodu AA, Osilesi O, Makinde YO, Osonuga OA, Fakoya TA, Ogunyemi EO and IE Egbenenkhuere. The influence of vegetarian diet on haemostatic risk factors for cardiovascular disease in African. Thromh Res. 1999; 95: 31 - 36. Dacie JV and SM Lewis Practical Haematology 6th Ed. Churchil. Livingstone Edinburgh and London 1991: pp 416 -417. Reid HL and AC Ugwu. A simple technique for Rapid Determination of Plasma Viscosity Nig J Physiol Sci. 1987; 3: 45 -48. Oviasu E, Famodu AA and EA Ojeh Plasma viscosity in Nephrotic Nigerian Clin Haem and Microcirculation 1998; 19: 163 -167. Ingram GIC A suggested schedule for the rapid investigation of acute haemostasis failure J clin Path 1961: 14: 356 -3 60. Osilesi O, Trout DL, Ogunwole JO and EE Glover Blood Pressure and Plasma Lipids during Ascorbic Acid Supplementation on boarderline Hypertensive and Nowmotensive adults. Nutr. Res. 1991; 11: 405 - 412. Kozlowska-Wojcie Chnowska M,xxxxxxxxxx this first name? Jastrzebska M, Naruszewie ZN and A Foltynska Impact of margarine enriched with plant sterols on blood lipids, platelet function land fibrinogen level in young men. Metabolism 2003: 52 (11): 1373 -137 8. Dutta-Roy AK, Crosbie L and MJ Gordon Effects of Tomato extract on human platelet agrregation in vitro. Platelets 2001; 12(4): 218 -227. Obasohan AO, Famodu AA and A Aigbe Abnormal fibrinolysis in Nigerian hypertensives .Tropical Cardiology 1991; 18(69): 17 - 21.